The International Journal of Social and Educational Sciences (IJOSES) publishes scientific papers (research papers, review articles, letters and notes) dealing with all branches of Social and Educational are published in Turkish and English. 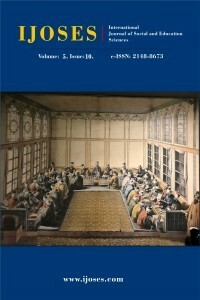 The IJOSES is published two times a year in June and December. The International Journal of Social and Educational Sciences (IJOSES) is the leading Turkish and English language journal for the study of social, educational, sociology, economic, political, diplomatic, religion, cultural and security issues that research the all social and educational branch. The manuscript has been submitted only to International Journal of Social and Educational Sciences; it is not under consideration or peer review or accepted for publication or in press or published elsewhere. All research articles in this journal have undergone rigorous peer review, based on initial editor screening and anonymized refereeing by two anonymous referees. NOW AVAILABLE - Online submission: Articles for publication in International Journal of Social and Educational Sciences can be submitted online through Editorial Manager, please click here. The new issue will be published June 2019. ASOS INDEX, Academia, Google Scholar, IdealOnline, ISAM (İslam Araştırmaları Merkezi), Research Bible, Research Gate, Scilit, TEI (Türk Eğitim İndeksi), tarafından dizinlenmekte. TÜBİTAK/ULAKBİM(TR) SBVT tarafından izlenmektedir.